Volume is my specialty. I routinely handle 50,000-100,000 words of copy per week, and maintain an on-call staff of half a dozen audio editors to master and proof my work, ensuring rapid delivery to meet any deadline. My most recent project involved 770,000 words of finance ethics and regulatory training delivered over just a few weeks. In August 2011, I had the privilege of completing the audio version of every word entry in The American Heritage Dictionary, for use online and in education. It’s entirely possible that I can now claim to be the only voice talent in the world to have recorded and been paid for every word in the English language! I have years of experience working for the highest profile, most demanding clients. Contact me now to see what I can do for you. With over twenty years as a professional narrator, J Michael Collins has worked with some of the biggest companies, brands, sports leagues, and organizations on the planet. In addition to his work in the classic, agency-based world of VO, J. Michael has established himself as the leading authority and top-grossing talent in the online marketplace and has become recognized as an industry leading talent coach and demo producer as well. 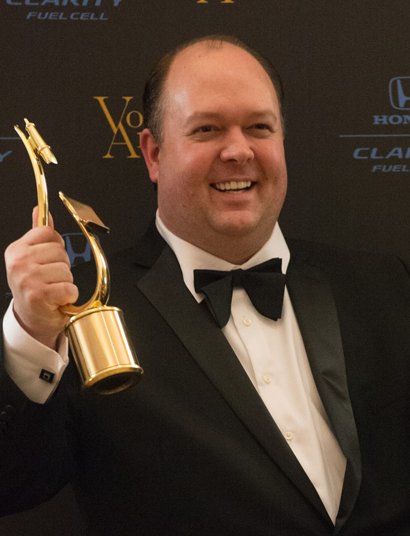 J. Michael was the winner of the 2016 VoiceArts Awards for Outstanding Radio Commercial-Best Voiceover, Outstanding Political Announcement-Best Voiceover, and was the producer of 2016’s Outstanding Narration Demo.